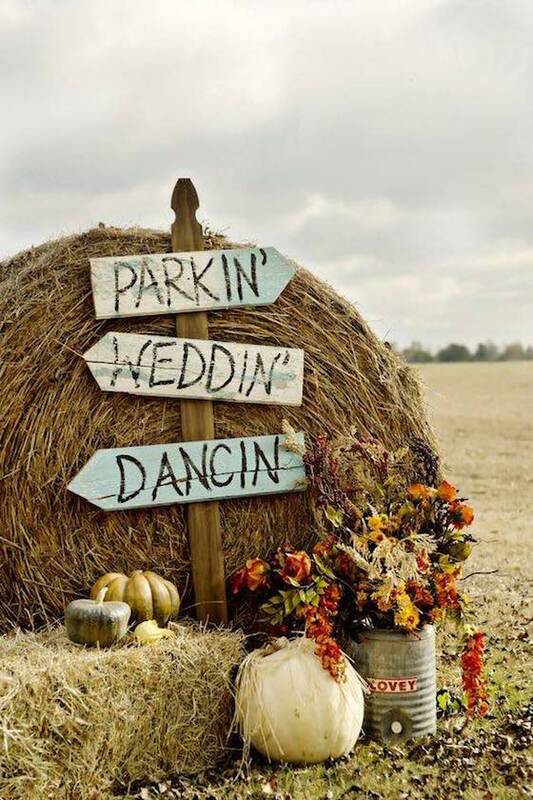 If we look at the forecasting trends, barn weddings are totally “in” for next year and the next. 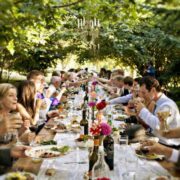 Discover all you need to know to host a barn wedding and be inspired by these 45+ deliciously lavish barn wedding ideas. There is something about barn weddings. 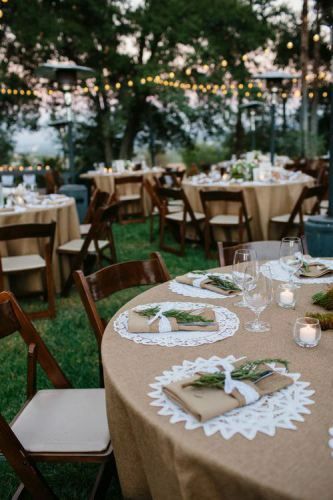 It’s not just that they are so country and rustic but they offer a lofty space to throw a bash that can go from simple to the most extravagant. 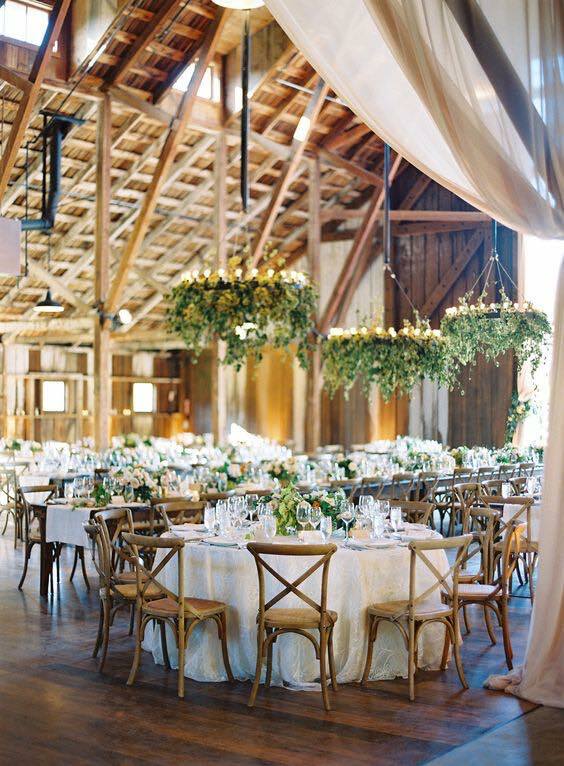 A barn’s vaulted ceilings and wooden beams tempt us to add lights, chandeliers and hanging centerpieces. Decorating barn weddings can be a dream come true, but fool yourself not, barn weddings are expensive. So it’s not all rosy on the barn wedding’s front. 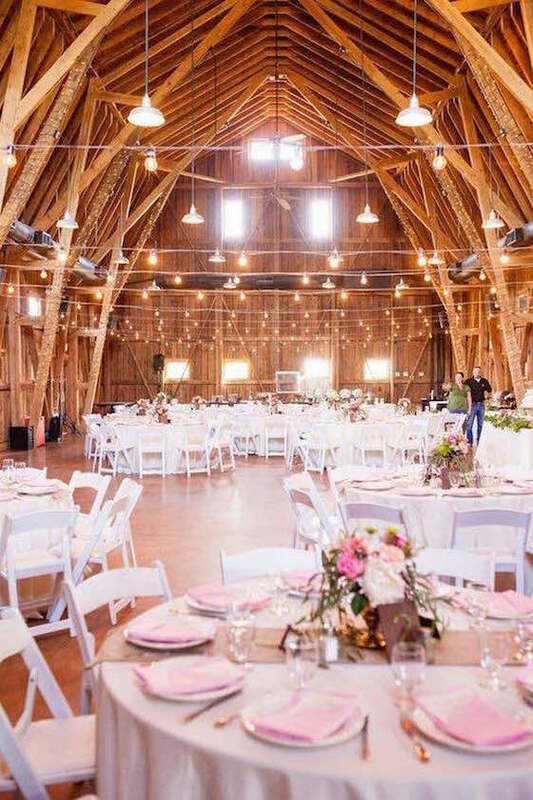 The first thing to consider when thinking about hosting one is that, contrary to popular belief, barn weddings are expensive. 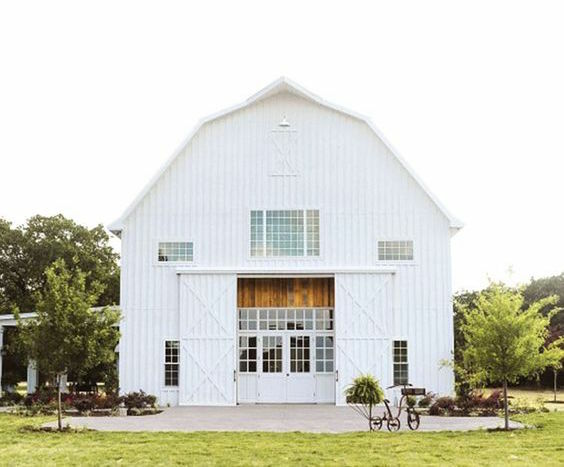 If your wedding venue utilizes an authentic barn, not one built for weddings and events where they take care of everything (and I mean everything), it may lack some of the bare necessities. These can be an unforeseen additional expense typical of these wedding venues. Here are some examples. 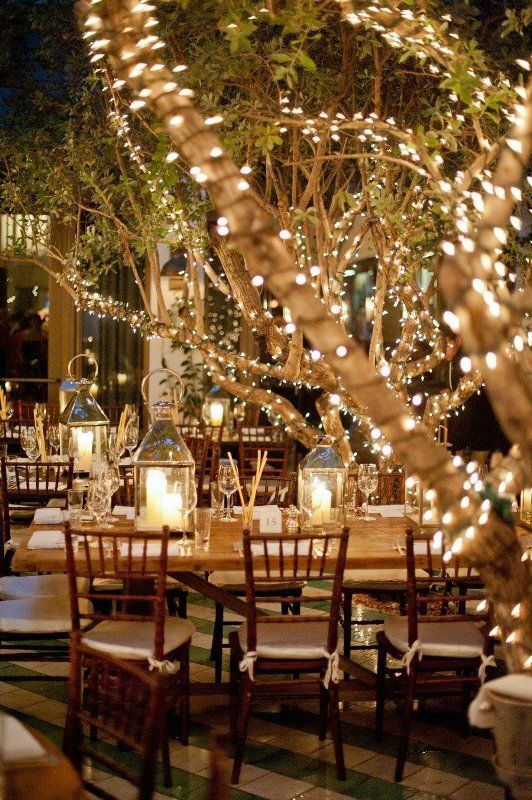 First of all, your caterer, the band or DJ and your lights will need access to electrical outlets. You will need three dedicated circuits, as to not blow out the power for the entire reception. Make sure the barn is wired for the occasion or rent a generator. 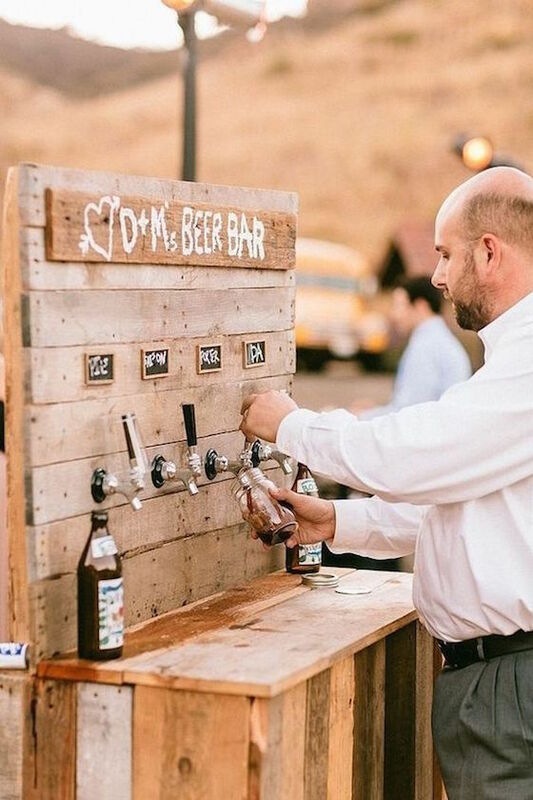 Next, you will probably want keep your guests cool or warm depending on when you host your wedding. 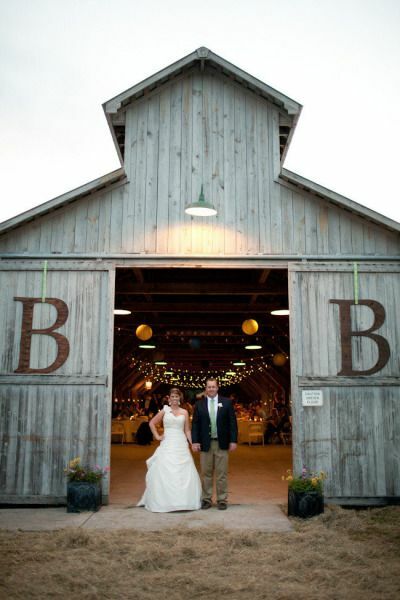 It’s best to host barn weddings in the spring or the fall months as barns may not have heat or air conditioning. Therefore, the rental of the needed equipment is another expense to consider. Predictions 2017-2018 The Danish Girl. 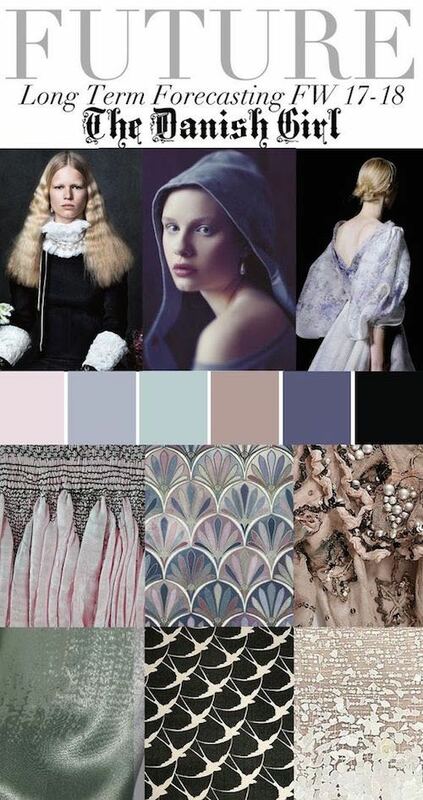 Grey, powder pink and blue, sienna, slate and black. 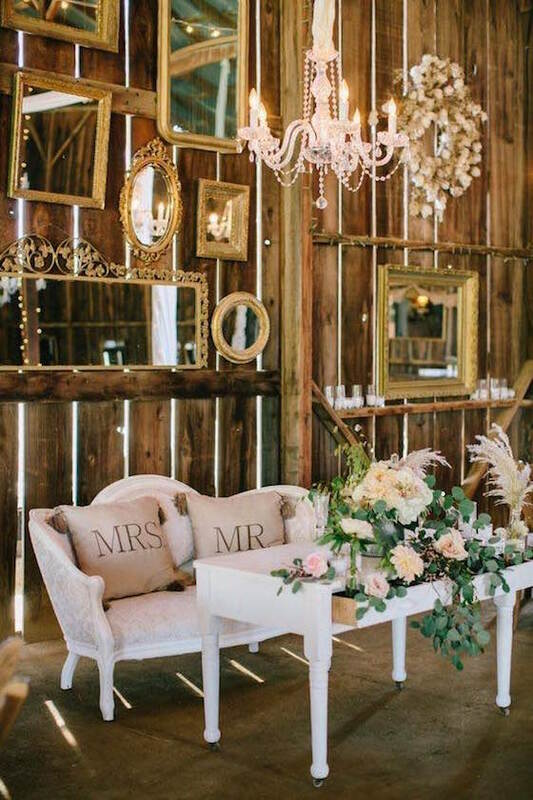 A very rustic color palette, perfect for Barn Weddings is the forecast the Trend Council, a fashion trend forecasting company who delivers expert analysis and design inspirations, is what’s in store for 2017-2018. Ensure the roof doesn’t have any leaks, wood is not rotting, etc. Keep an eye out for any items in need of general repair or attention. Ensure these will be taken care of way prior to the wedding date. 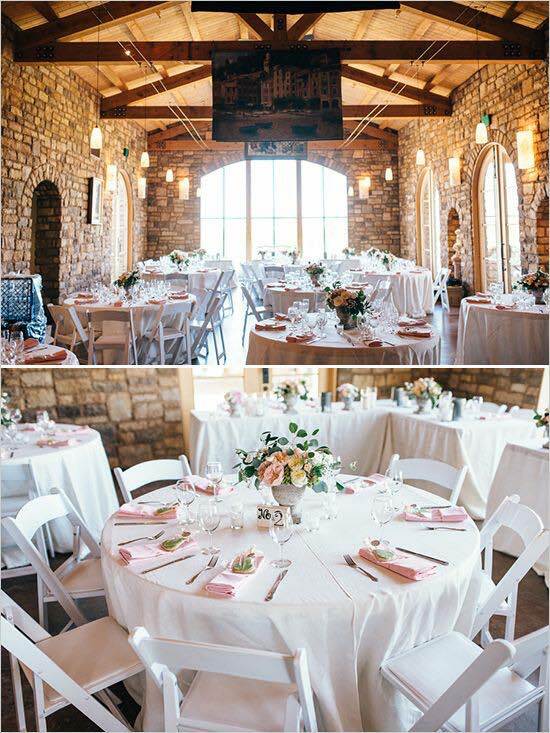 Carmel barn wedding captured by Jose Villa Photography. Next, depending on the barn, you may need a license and insurance to be open to the public. You should also look into sound ordinances. Even though the barn may be remote, sound ordinances do apply. They will affect your music volume and the wedding schedule. As it is usual in the countryside, parking is a long ways from the barn. Think about special transportation arrangements from the parking to the venue for your guests. 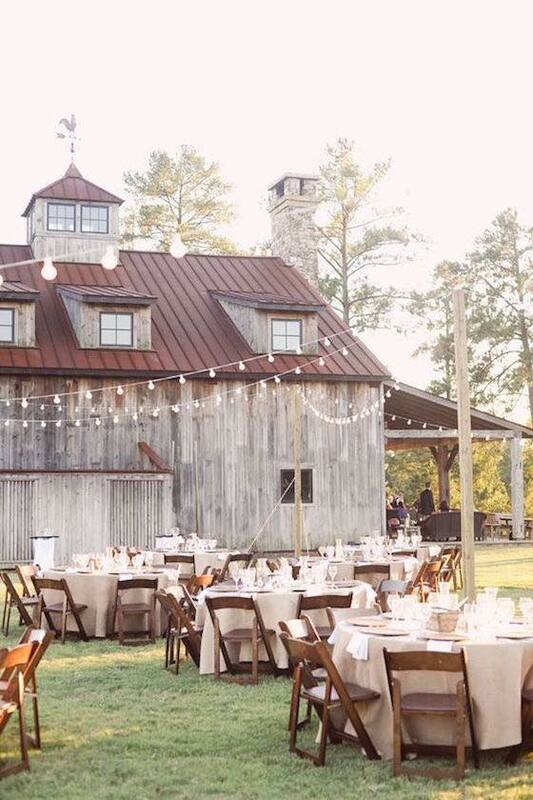 Finally, if you took the high road and booked a barn that generally hosts weddings, their owners may have the necessary rentals handy and a list of what else you’ll need. 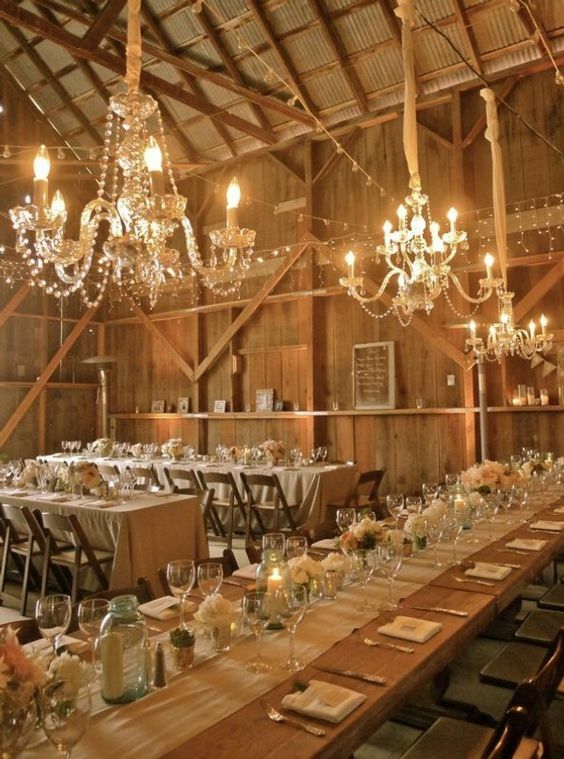 If not, your best bet is to work with a wedding planner who specializes in barn weddings. 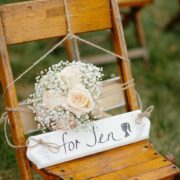 Bride and groom chair decor via Etsy. 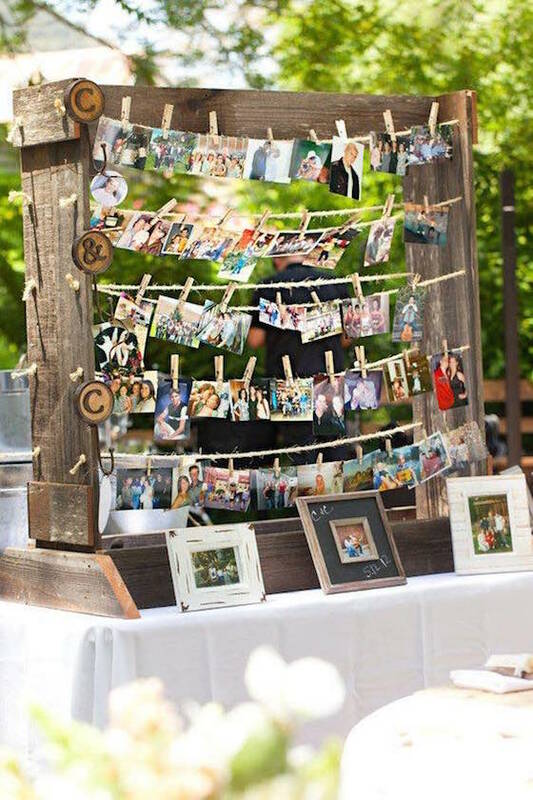 It’s mistakenly understood that barn weddings can only be rustic or country themed. 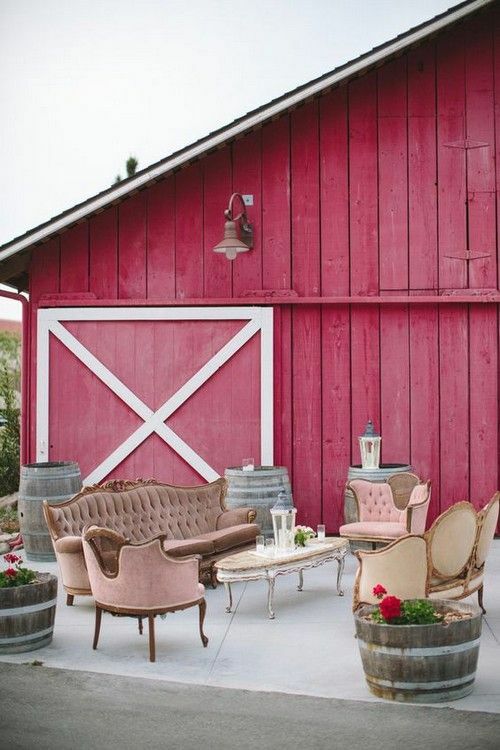 Most wedding themes go well with a barn. Go minimalistic or go vintage. 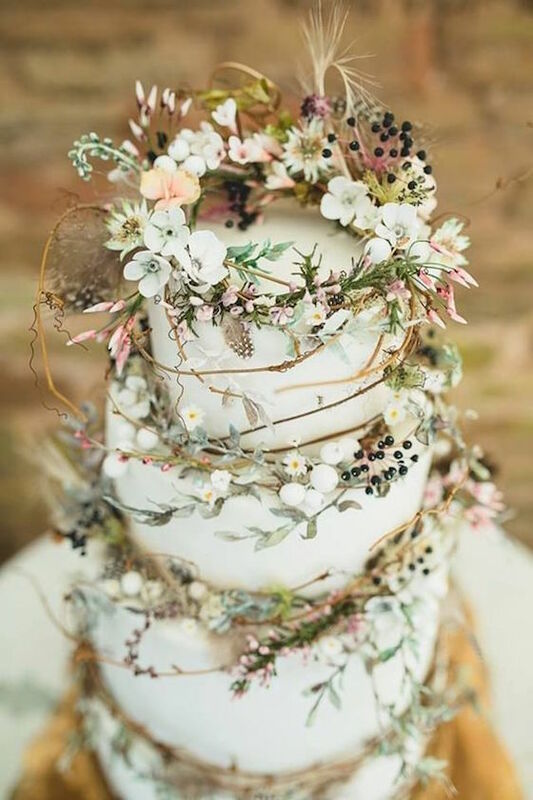 You can even go rustic glam, boho chic or extremely whimsical! 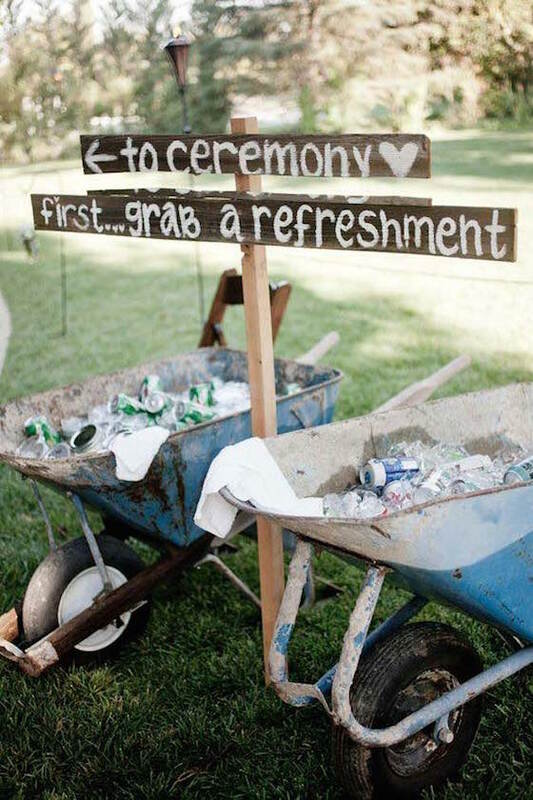 Consider holding the reception outdoors. 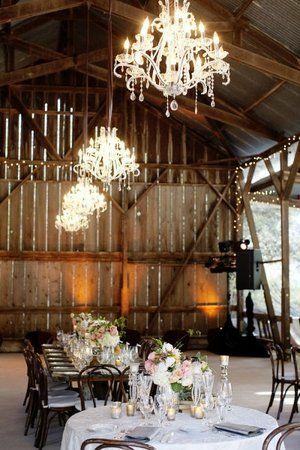 Place the tables outside the barn and the dance floor and bar inside of it. Therefore, when it gets cool outside, your guests have a warmer place where to have fun. 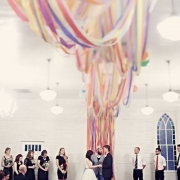 Another idea to consider is celebrating the religious ceremony inside of the barn. Then you can eat outside and party again inside. 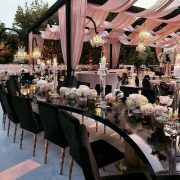 This will give you enough time to remove the chairs from the ceremony and redecorate this unique space. 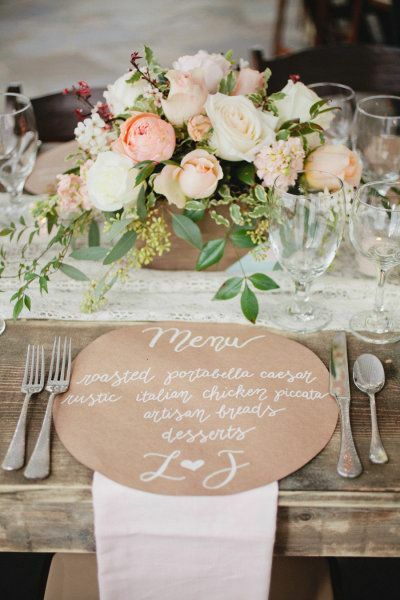 Barn weddings with dining alfresco. Interested in achieving a flattering and cozy look? 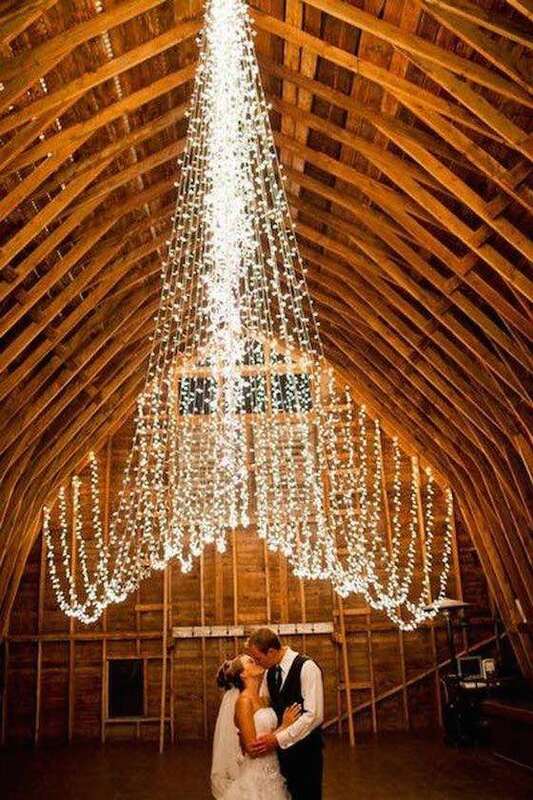 String up lanterns and twinkly lights, add garlands of Christmas lights to the barn’s ceiling! Barn wedding tip: The weather conditions will determine what kind of icing you should have on your wedding cake. It maybe the reason why cakes for barn weddings are usually naked. 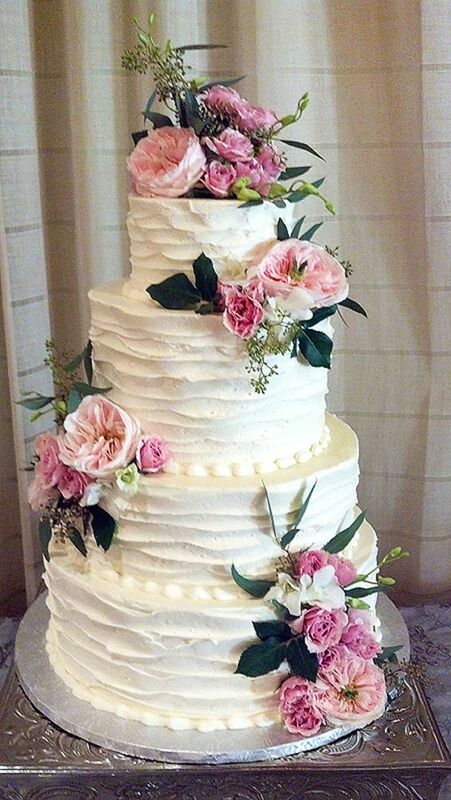 Rustic country old-fashioned buttercream wedding cake with pink flowers. 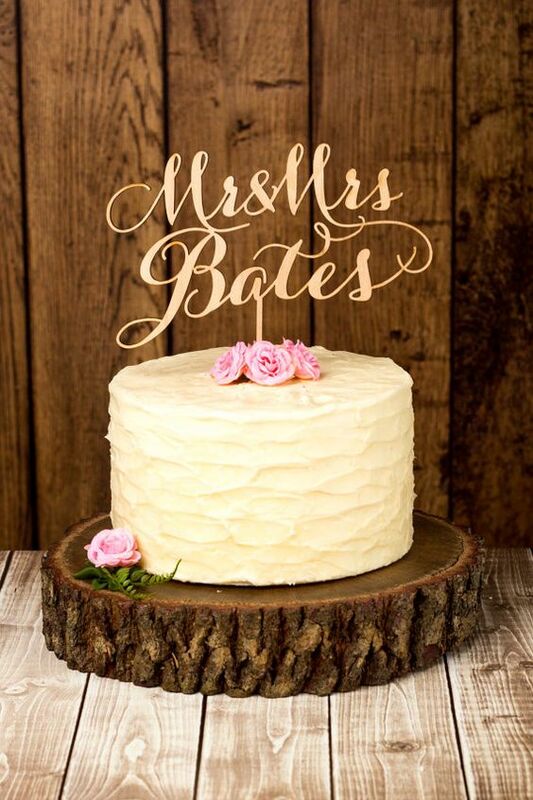 Custom rustic wedding cake topper by Better Off Wed Rustics. 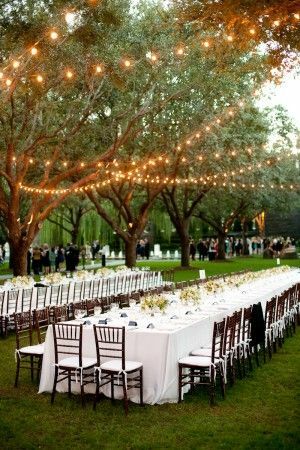 Outdoor wedding decor. Absolutely beautiful. 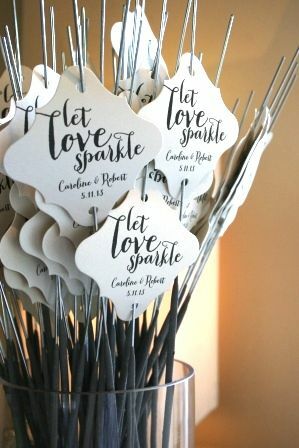 Let Love Sparkle. A fun send-off idea for the happy couple. 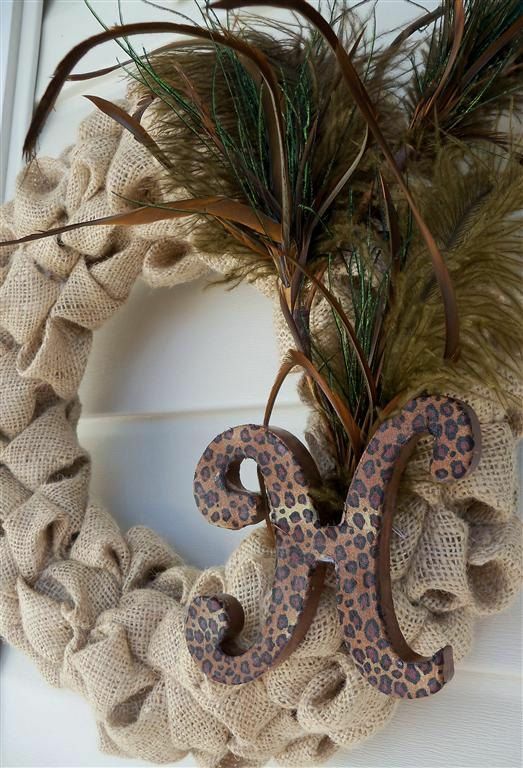 Burlap bubble wreath with feathers and monogram letter. Austin wedding ceremony. 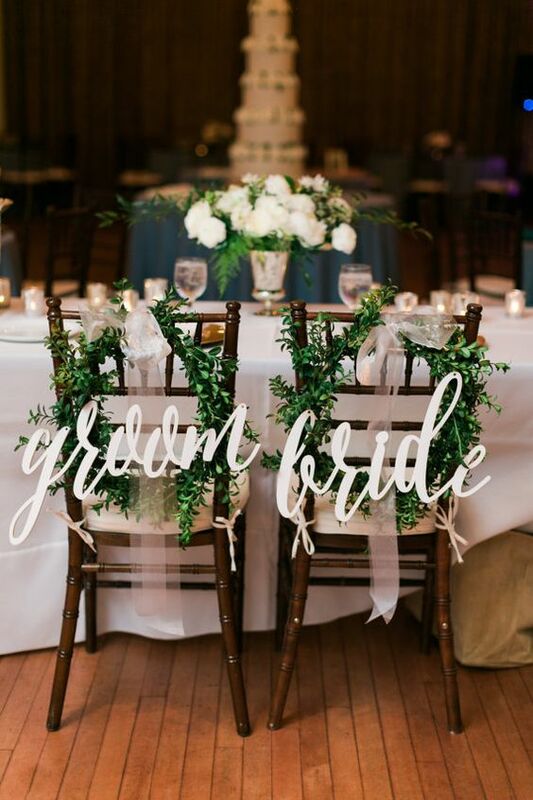 Add greenery garland to white sheer curtains. After the ceremony move to wedding party table for reception. Tablescape at Historic Cedarwood, Nashville Wedding from Kristyn Hogan photography. 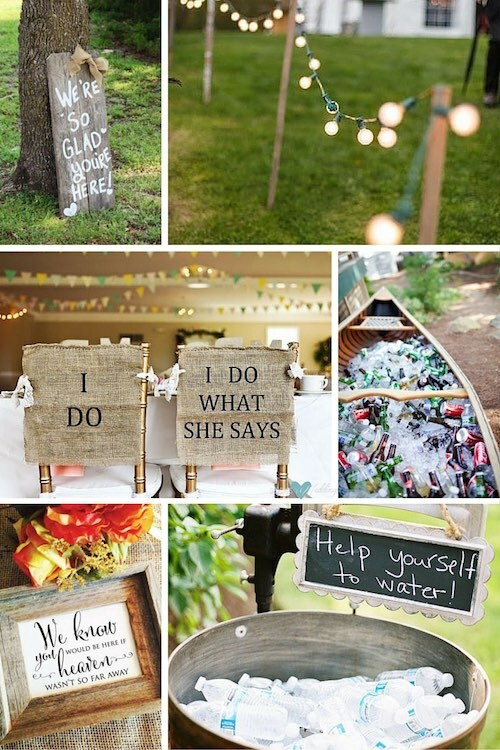 Country wedding reception lounge decor vintage meets rustic. 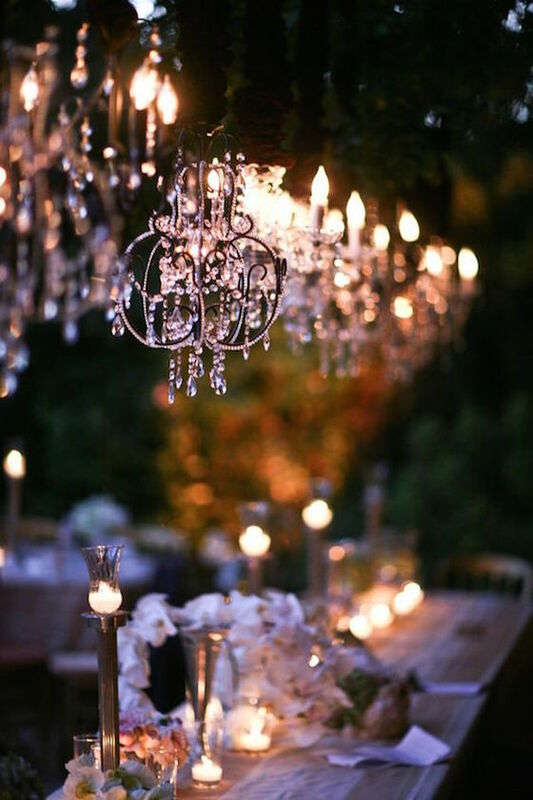 Wedding reception living rooms or lounge areas have become very popular in recent years. 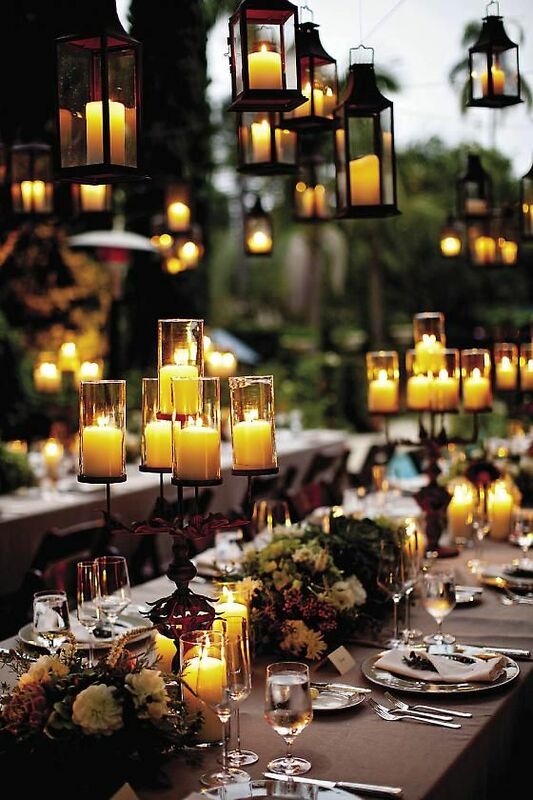 It’s a great way to give wedding guests a cozy place to relax, chat. 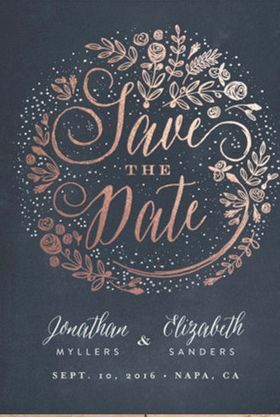 Foil pressed Save The Date cards perfect for glam barn weddings. Rustic elegant barn wedding in Santa Barbara by Joy de Vivre + Mark Brooke Photographers. Isn’t it a dream come true? 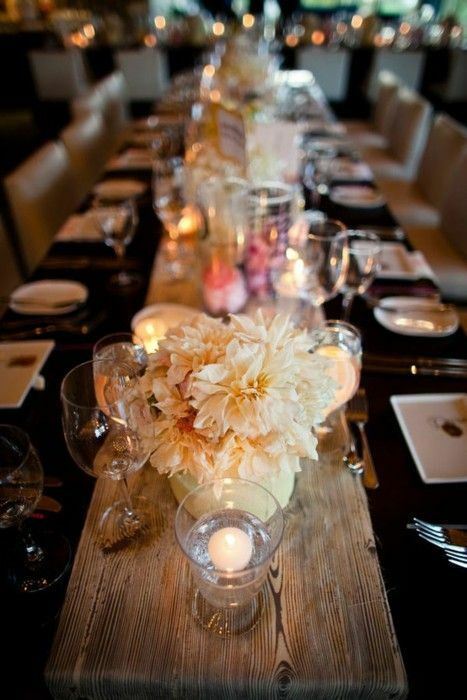 Black and gold wedding table with a wood beam as a table runner. Talk about glamming up the place! 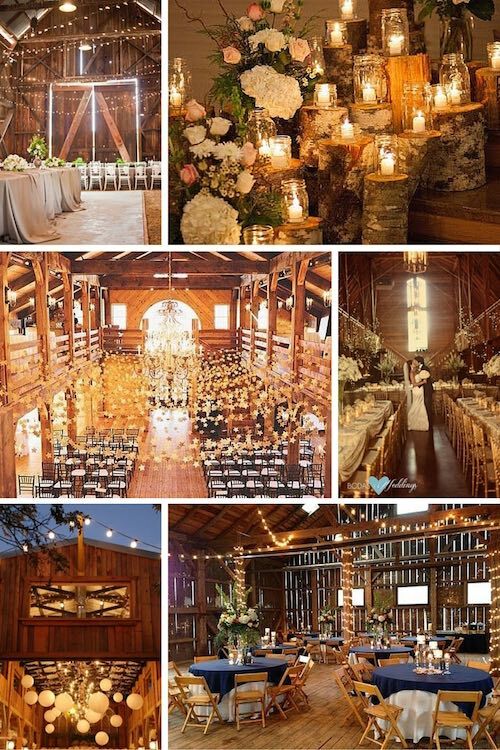 Incredible barn venues for weddings. 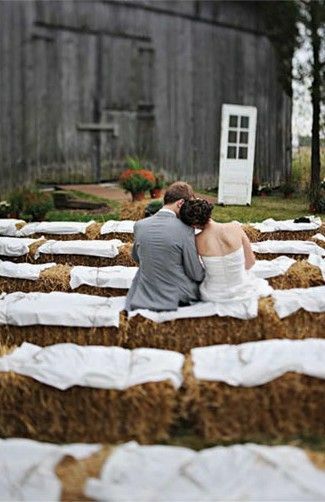 Love this idea of having hay bales as seats but remember to have real chairs for older guests. 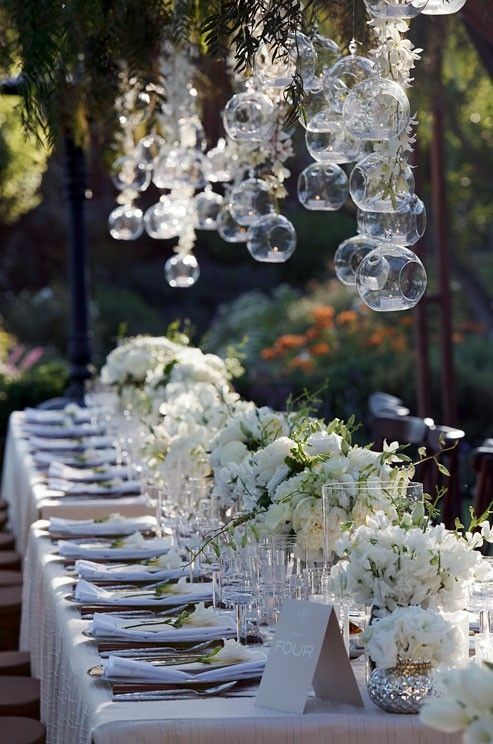 Outdoor Wedding reception decor: floating bubbles with tea lights will give your table a very magical appeal. 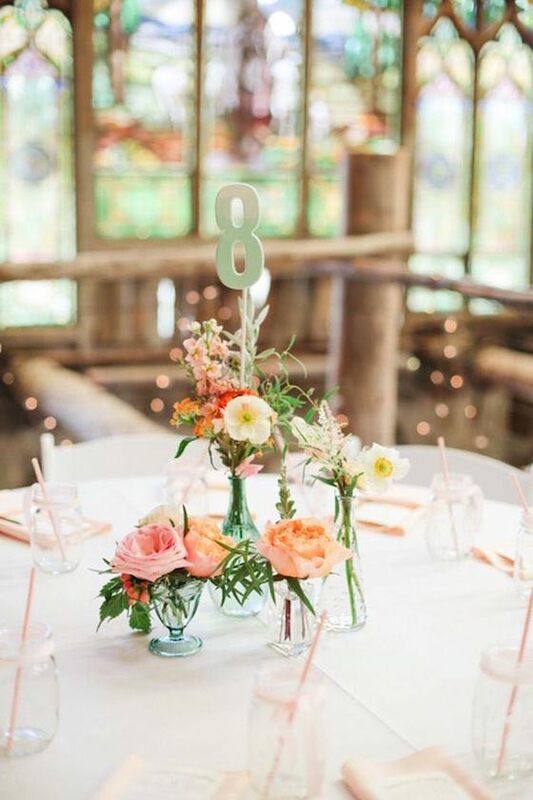 Wedding centerpieces you can DIY. 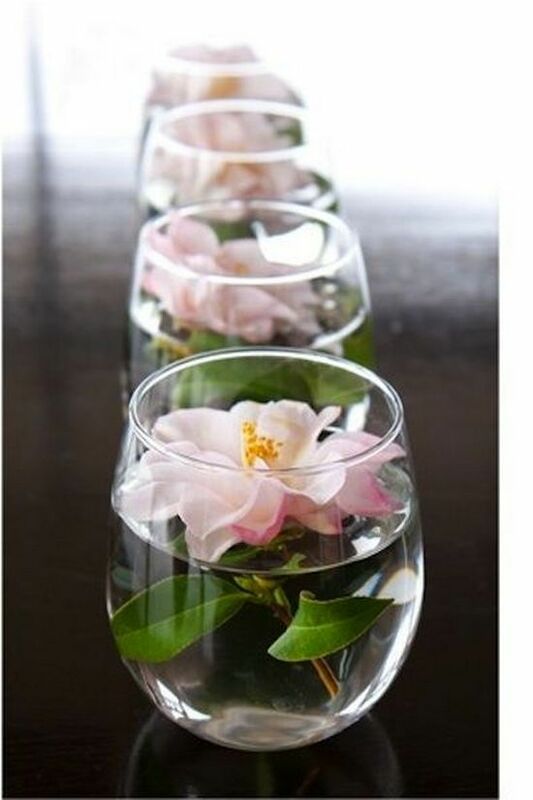 Glasses, blooms and water. 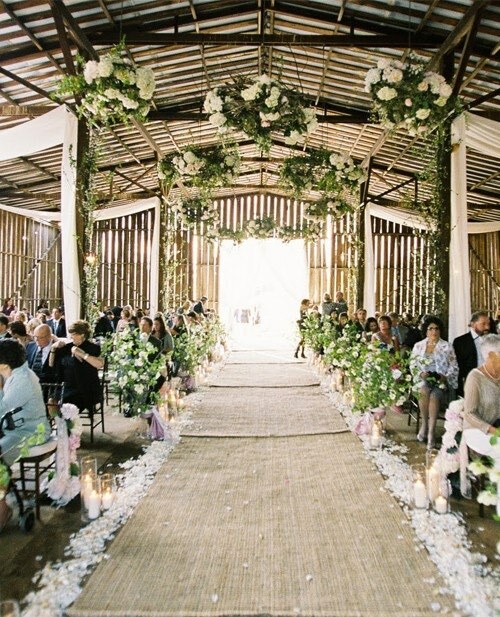 Barn wedding aisle with burlap runner. 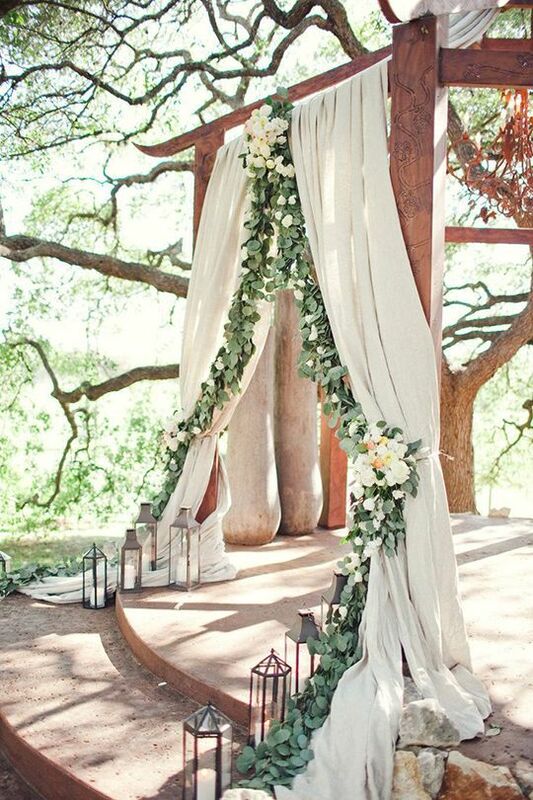 Love the hanging greenery over the aisle. How to DIY your own floral chandelier.